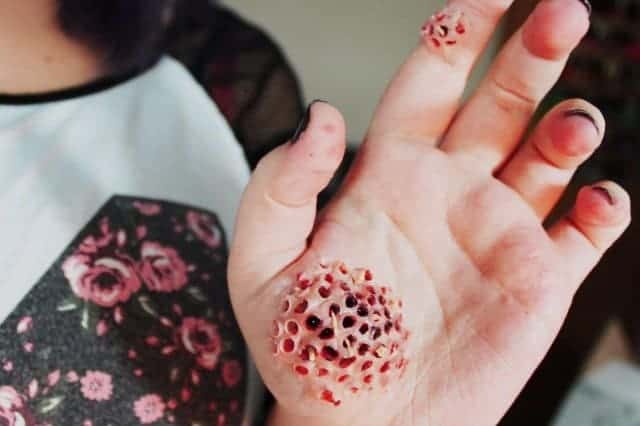 Trypophobia (Fear Of Holes On Skin) : Is This Really Exists? Trypophobia is the most common arguing topic among psychologists today. It was introduced to the phobia list in 2005. It is a new phobia which has come into the picture. Most people are unaware of it and its effects on human body or psychology. Tryphobia is not yet recognized in the American Psychiatric Association’s Diagnostic and Statistical Manual of Mental Disorders (DSM) or any other scientific literature. Still, an estimate of 15% of world population claims to have this fear. Every person has a different psychology so it might be difficult to state any particular case. Although, I might help you to fit some pieces of the puzzle together. Is Trypophobia Skin Disease Real? What Are Some Basic Reactions To Trypophobia? 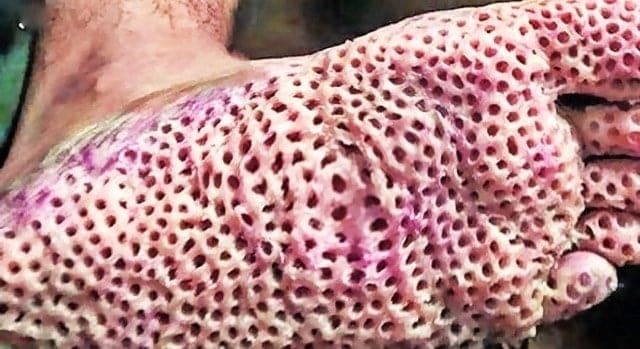 Is There Any Treatment Or Cure For Trypophobia? 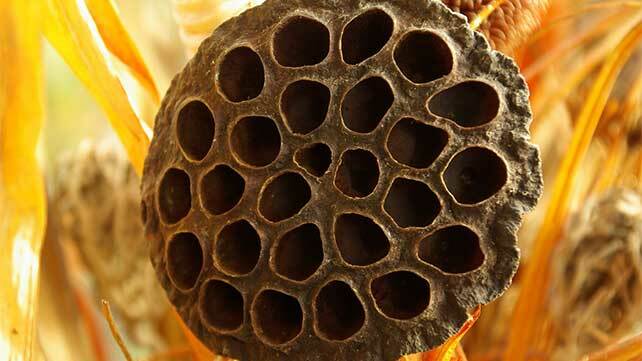 Trypophobia is a recently discovered pathological fear of objects with the irregular pattern of holes. It triggers an emotional reaction amongst an individual when shown a harmless picture of the cluster of objects, usually holes. It is an uncontrolled reaction of self-defense and repulsion. Even looking at a picture of patterns like beehives, anthills, lotus sea heads, etc. can make some people nauseous. People with this fear are called Trypophobics. Trypophobics have a feeling that they will fall into these deep dark holes. Eventually, they link these openings/patterns with the fear of holes in the skin. As a result, they imagine the holes to be present on their body. This makes the infected individual hesitant to look closely at his or her skin. To everyone out there with the phobia of holes, you are not alone. Trypophobia is one of the most common fears, but it can be treated. The right answer to this question is that this phobia is psychologically real. Although, there is no such medical condition known to cause holes in the skin. All the picture on the internet showing holes on human skin is fake and photoshopped. However, there might be some different dermatological disorders like smallpox, leprosy, etc. I will mention here that these conditions are physical while trypophobia is entirely psychological. Some universities conducted a variety of surveys and researchers. It involved showing certain images to different people. It included images of natural objects such as the honeycomb or the lotus seed head. Based on some people’s reactions, it was concluded that it is not the holes that they fear. Instead, their brains associate these holes with danger. The type of threat they sense, exactly, is still being studied. Some responses might be a result of a deeply rooted emotional issue. While some could be a result of recent traumatic experiences. For ex. A person who once suffered from a skin rash or chicken pox might have a phobia of clustered holes. A person who once had a bee sting or saw someone with a hand of bee stings, might give a trypophobic response towards beehives. The reason being in both the cases is that it brings back a traumatic or ugly experience from their memory. People who find trypophobic images aversive, experience some emotional triggers. This is because every image has a configuration. This configuration gives some mathematical properties to an image. These properties induce certain emotions in an individual. This causes the variety of responses like visual discomfort, eyestrain or a headache. This discomfort occurs because it is a mechanism for avoiding excessive oxygenation in the brain. As a result, People avoid looking at the images that require excessive brain oxygenation. (The brain uses about 20% of the body’s energy, and its energy usage needs to be kept to a minimum.). This mechanism is overworking among Trypophobes. Please avoid the below section if you are feeling discomfort.The below images might cause uncontrolled emotional disturbances. The reactions of Trypophobes to this fear of holes is intense. When shown some related images, It can make them feel that their skin is crawling. It can make their body shudder, give an itchy feel and make them physically sick. They find it disgusting and gross. Some of these people are even afraid that something might be living inside these holes or that they might fall into them. It can also trigger anxiety and panic attacks. The severity of reactions can be tested by the type of symptoms you possess while taking trypophobia test or looking at related pictures. NOTE: IF YOU ARE A TRYPOPHOBE AND YOU DO NOT FEEL COMFORTABLE IN READING THE DETAILS, YOU CAN SKIP THIS SECTION. Whenever a trypophobic person is triggered, he or she will have goosebumps. They will have it until they are no longer triggered. I believe it is a kind of self-defense mechanism that one’s body chooses as a response to anxiety. Whenever your body thinks that you are in danger, your heart rate increases. When a trypophobic views a triggering image, they start over analyzing it. It has such a high presence for them that they are unable to focus on other things. When you have seen an image, it flashes in your head continuously. At that moment, you feel panicky and feverish. You lose control over your mind. In my opinion, it is an unpleasant experience when you are in a war with your mind. When you try not to think about something, it triggers you more and drives you crazy. Due to this, a trypophobe starts experiencing their fear more and more in daily life objects. Examples can be a showerhead, bubbles of oil in a frying pan and even the texture of a toilet paper. Other reaction to this phobia includes anger and aggression. It is possibly due to a desire to destroy the clusters. It is a natural response after you have been scared by something for a long time and can make you cry. How To Know If You Are Trypophobic? The trypophobia test contains two steps. First is looking for some trypophobic pictures. Second is checking for the symptoms and signs. We have put few pictures above ask yourself do you find these pictures normal or they create a feeling of anxiety, fear, grotesque in you. If the answer is yes then you are tyrophobic. 1. Take a soccer ball and make it inside out. See if you feel any of the symptoms of Trypophobia. 2. Get an orange and cut it into two halves. Look at the tiny hole in the middle of it. If you feel anything different, you might have this phobia. You can do the same with a cantaloupe and observe your reaction. 3. The next one is to get a picture of a honeycomb. Look deeply at that tiny holes and see if you have any of the above-mentioned reactions. Try repeating the process with a picture of ant holes. 4. Try looking at photographs of acne ( open ones ) and lotus flower seed pot. Observe your reaction. 5. Frog eggs are also known to cause the symptoms and signs of the Trypophobia. Try focusing on those for a while and find out what happens. Everything has its cure in this world. Especially if the problem is psychological. Although it takes a lot of mental solidarity to reduce your sensitivity towards trypophobic triggering objects. You will be exposed to several days ( or longer ) of gross feeling, discomfort, fear, itchy feeling, nausea, and anxiety. Commit from the starting itself. Giving up in the middle of therapy will probably make you worse. An individual undergoing this therapy allows themselves to change and control their unwanted behavior. Through the therapy, one could learn how to cope up with trypophobia during difficult times. Especially when they are exposed to tiny holes. The main goal of this therapy is to alter the harmful and unproductive thinking patterns of trypophobic people. Sufferers examine their feelings and learn how to separate real thoughts from unreal ones. There is some therapist who uses the mixture of the above two therapies for trypophobia. In this, the sufferers learn some skills of recovery that helps them in their everyday life. In this method, trypophobe people are exposed to their phobia repeatedly to decrease its impact over the time. Typically, the interventions are fast and efficient. Therapy in which a Trypophobe is indulged in a non-exhausting stimulus until the negative response dies out. In this method, you get to watch others participate in sessions or exercises. This would bring about a positive response in you. One method to perform this is to observe the removal of a bot fly in any non-trypophobic person. The real act of a bot fly being removed from someone while they are conscious and calm would enable you to treat your fear of gaps in a very non-threatening and latent way. Some of these trypophobic responses are strong. Such type of reactions must be visualized and observed. If these responses are triggered more, they might do some damage to an individual. Although, relaxation therapy is used systematically to desensitize the Trypophobia later on. Remember, you cannot get rid of your fears completely in one single go. You have to be patient. It is believed that people with high level of fears take weeks to get over it. Just Face your fears with full courage and do not give up. Once you get better, you can look at trypophobic objects, walk away and forget about it. In case, If you feel too much affected and you cannot get rid of it, just talk to someone you trust. Talking to others always help in some situations. Your troubles are like poisons. The more you keep them inside, the more they kill you. The more you spit them out, the more you are alive. Therefore, pick up your best friend or your trustful person and talk to him or her. That might help you a lot. 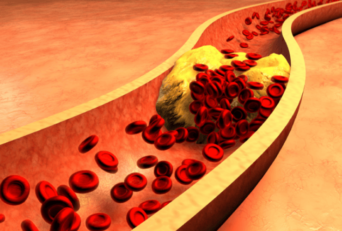 How To Reverse Fatty Liver Naturally? How To Make Your Old Tattoos Look Good Again Naturally?